This is an awesome low-carb version of loaded baked potatoes, and tastes far better than any version of mock potatoes that I have tried. In fact, this dish is soooo good, you will not believe it! I do not remember where I got this recipe, but it is a fabulous side to any low-carb meal. You will be pleased, I promise! Yum! Yum! Chop cooked cauliflower into very small pieces. Mix sour cream, 1/2 of the green onions, 1/2 of the cheese, 1/2 of the bacon, and salt and pepper to taste in medium bowl. 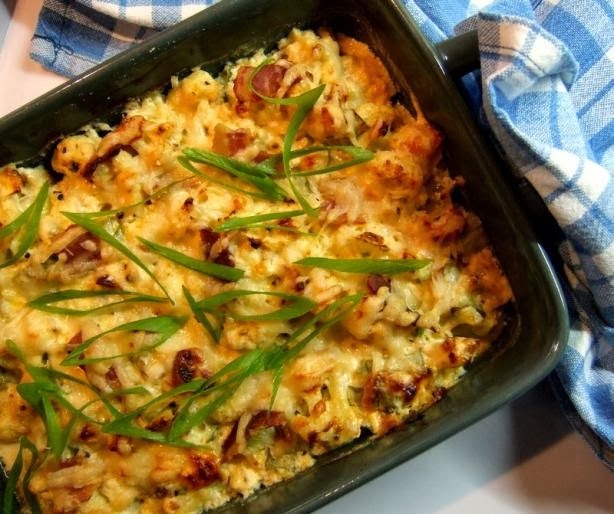 Place in medium baking dish and sprinkle remaining cheese and bacon on top. Sprinkle the remaining green onions on top just before serving.